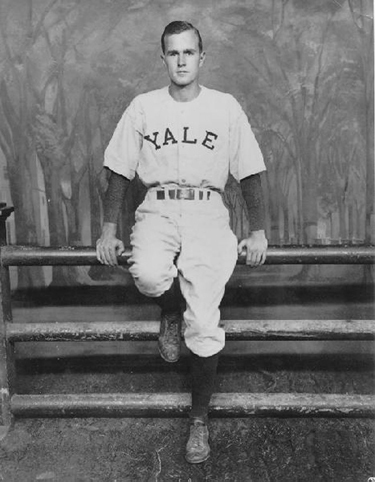 George H. W. Bush, captain of the Yale Baseball team. As the photo above demonstrates, George Herbert Walker Bush was the living embodiment of the All-American Boy ideal represented in fiction set at Yale by Dink Stover and Frank Merriwell. He was handsome, athletic, well-born, a good student, and a fine sportsman, captain of the Baseball teams at Andover and Yale, tapped inevitably for Skull and Bones, youngest pilot in the Navy during WWII. He was a good and decent man, embodying to perfection all the virtues and weaknesses of his culture and his class. Alas! he was too indifferent to theory and ideology to make a good conservative president. He was the sort who behaves with propriety and who governs in accordance with the best opinions, so he broke his word to the voters, raised taxes, and consequently lost in 1992 to a slick con man. I knew him because he was so dutiful and so loyal to Yale. Back in the late ’60s and early ’70s, whenever a scheduled conservative guest speaker at the Yale Political Union cancelled, we knew that, even at the last minute, we could always get George Bush. We took advantage of him regularly, and –back then– he was only a minor Texas Congressman or defeated GOP candidate for the Senate, no kind of big name. It fell to me several times to take George Bush to dinner at Mory’s. He just wasn’t famous enough in those days to draw a crowd, so he and I would eat dinner alone, talking typically of the differences between his time at Yale and mine. He wasn’t scintillating like Bill Buckley or dazzling like Ronald Reagan, but he was a classic example of the kind of good man and faithful public servant that the Old Yale specialized in producing. In fact, he was kind of a Rowland Ward record book specimen of that breed. It made me sad to recognize that America, Andover, and Yale had stopped making any more like him. Yale men of my own time, I thought, were cleverer, but men like George Bush were a lot better for the country. 5 Feedbacks on "George H. W. Bush, 12 June 1924 — 30 November 2018"
A good and decent man that made for himself a life well-lived. RIP. He was a hero, and a fine President. I have his signature on a letter from the White House. He cared about his fellow citizens. RIP (now I wish I knew his WWII radio call-sign). Wonderful eulogy for a very decent man, who could have been a good President in less troubled times. May he rest in peace. And to think this man would have been reelected but for Ross Perot. And we would have avoided the Hillary Ordeals. Every time I think what a great man George Bush was, I think of that despicable man, Perot.